Like Klein’s hypocrisy in using corporate structures in order to decry them? I have no love for those who have double-standards, and even less so for those who break laws in order to do harm to those who are law-abiding, regardless of their beliefs. They support a side not a principle. Simple as that. Now more obvious than ever. To all those sending kind words and thoughts, I deeply appreciate them. 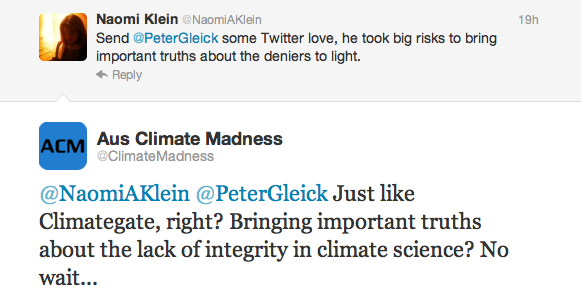 Pete hasn’t actually taken one for the team, he’s the one that scored an own goal for the warmist team. It must be the only own goal in history where the scorer is made the player of the match. Go figure! You’ll probably have something on this shortly, but does Rudd’s quitting hasten Julia’s crash and burn? The CO2 tax bills are already arriving, aren’t they?